Industrial gas turbines tend to work in high ambient temperatures, which can get even higher during on-peak power demand periods. This can be a big deal when aiming at power augmentation, especially in hot climate areas such as the Middle East. This is why Thermal Storage Systems are standing out as one of the best solutions, both from an economic and an energy efficiency perspective. These high temperatures have a negative effect on the power output of the turbine due to the decrease of air density. If the density is lower, the mass flow rate also decreases and, as a consequence, the power output is reduced. 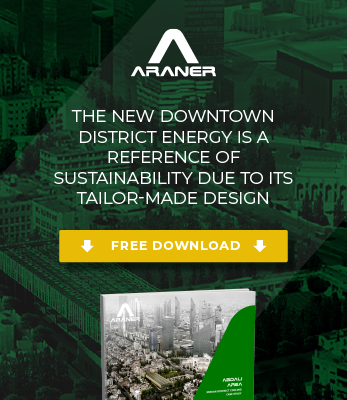 For this reason, ARANER designs tailor-made Thermal Storage Systems which can complement the chillers of the Turbine Inlet Air Cooling (TIAC), storing the chilled water produced by the chillers when there is low demand and using this energy when the turbines need to work harder. With this system, the turbine inlet air is ccooled down, increasing its power output and also saving electrical consumption by having the chiller stopped during this period of time. Inlet air of gas turbines needs to be chilled during a limited number of hours per day to increase their power output. To achieve this, a chiller and a Thermal Storage System must be installed to supply the necessary cold water. These are some of the advantages of implementing this energy storage solution. The footprint of the chillers can be reduced. Chillers will not need to make extra effort during high energy demand periods, since stored energy can be used to save the peak. With TES Tank the chillers are not sized for peak cooling demand but for daily average demand, therefore their size can be smaller. Electrical consumption is minimized. During the discharging period, chillers are stopped and will not consume electricity. This will maximize the extra power produced due to TIAC system. Efficiency of the overall system will be higher. Since the chillers are not working full time, there will be a more efficient use of the overall energy produced. Economic benefits. In spite of the water tank cost, the investment will also be normally lower than the one required for an entire TIAC infrastructure. Because of all of these advantages, thermal storage tanks are one of the best options when looking for more efficient power augmentation in turbine inlet air cooling systems. Which are ARANER’s Thermal Storage Systems? At ARANER, we provide the most advanced engineering Thermal Storage Systems and create intelligent solutions for our customers. Thanks to this, we design, manufacture and install TES solutions that can suit any existing TIAC system. We mainly use two technologies for TES Tanks. On one hand the ice storage tank is an ice generator that accumulates the excess of power by generating ice. It is provided with an evaporator located in the upper part, a storage tank in the lower part, and two pumps for the charging and discharging periods. One of the pumps sends the water to the evaporator, where it freezes until ice pieces have the appropriate thickness. Once this is achieved, they drop into the storage tank. The other pump then sends the water from the tank to the coils of the load, where it is heated and goes again to the evaporator. Water is not converted into ice because of its high temperature but drops as cold water into the storage tank, starting the process all over again. Besides the Ice Harvesting technology, Ice storage tanks can use External and Internal Melt Ice-on-coil Storage systems. The External Melt Ice-on-coil type, also referred to as an ice builder, builds and stores ice on the exterior surfaces of a heat exchange coil submerged in a non-pressurized water tank. The Internal Melt Ice-on-coil Storage uses a secondary coolant as the charging and discharging heat transfer fluid, circulating it through tubes or coils submerged in water-filled tanks. On the other hand, the naturally stratified water storage tank is a tank that can store both chilled and warm water thanks to the naturally stratified technology. One of the pumps sends the warm water from the upper part of the tank to the chillers, where it is cooled and comes back as chilled water to the lower part, increasing the volume of cold water. To minimize the mixture of cold and warm water, the tank has diffusers which achieve natural stratification through the use of buoyancy forces. Both Thermal Storage Systems can be designed specifically for every installation depending on their needs. Parameters like the inlet and outlet water temperature, the figure of merit, and the height and diameter of the tank are taken into account. Contact us for further information.